Tita wanted to love Pedro freely, but her mother had other plans and confined Tita to serve her for the rest of her life. Poor Tita had so much love and lust that she unintentionally added to her cooking. 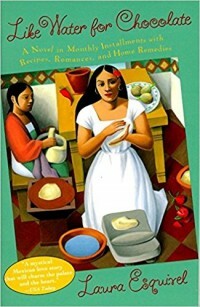 Each recipe Tita cooked every month of one year connected with the theme of the chapter, and Tita’s feelings in her food affected her family. For example, Tita’s mother became sick from the bitterness that was in Tita’s meal and her sister was nearly burned alive from lust in another. This modern folklore had me laughing at its absurd humor, sympathizing with Tita’s tragic circumstances, and thinking through the many foreshadows, tropes, and symbols. What a charm!